Shares of the two largest steel producers,US Steel and Steel Dynamics, rose following news of Gary Cohn’s exit from the White House. Cohn’s departure reignited fears of a global trade war after President Donald Trump announced proposed taxes on imported steel and aluminium. Global stocks dipped Wednesday as investors digested the news. 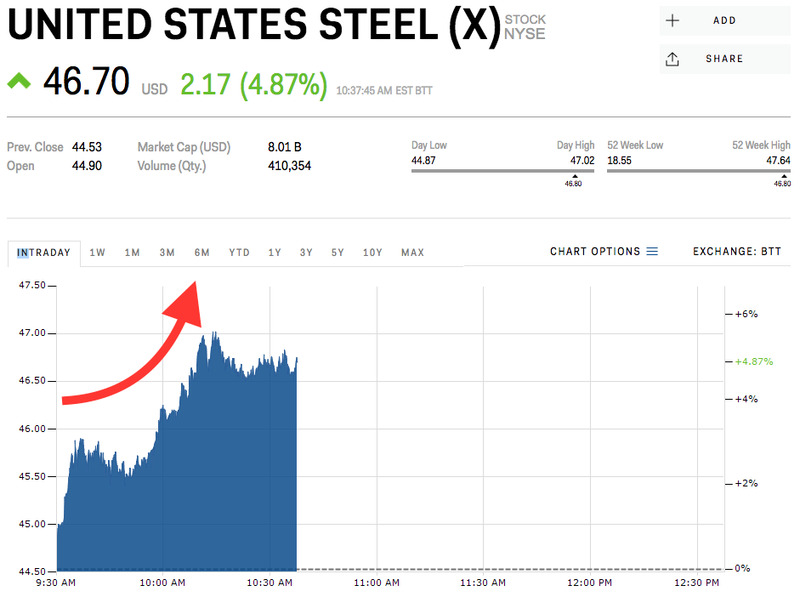 Shares of the largest US steel makers jumped Wednesday morning after President Donald Trump’s top economic adviser, Gary Cohn, said he would step down from his role over disagreements with the proposed taxes on steel and aluminium imports. Cohn’s resignation supported the belief that Trump would go through with his proposals despite widespread condemnation from the international community and even some members of his own party. The news is tailwind for domestic steel manufacturers because they stand to benefit from the import tax. US Steel’s shares have climbed 6% since Trump made the announcement last Thursday. Since making his comments last week, Trump has doubled down on his intent for tariffs, saying “trade wars are good” in a tweet on Friday, though he later said he doesn’t think there will be a trade war. Read more about how the auto industry is reeling from the news of Trump’s proposed tariffs.